MINISTER FOR JUSTICE Alan Shatter has spoken about the ongoing row over Deputy Mick Wallace and penalty points. Speaking today, Minister Shatter said that he was told at a garda briefing on road traffic offences that Wallace benefited from garda discretion after being found driving while using a mobile phone. in the context of the general briefing that I received about the exercise of garda discretion, the example of discretion being exercised in the context of Deputy Wallace was given to me. And I have no row about the exercise of that discretion. I have not, nor will I suggest, that Deputy Wallace did anything improper. Shatter said that what he took issue with was that Wallace “has made the case that the gardaí are acting unlawfully” by using discretion. Now, as a minister I have an inconvenient habit of telling the truth about issues. It occasionally gets me into trouble, telling the truth. I am quite willing where I think there is a public interest to confront an issue where there is reform needed, to address the need for that reform or where people are making cases that deserve questioning. The Minister said the only reason he raised the issue is because the Deputy is a public personality. He said he felt it important to point out to Deputy Wallace that he had benefited from discretion, “but as far as he was concerned it was always going to be a major scandal if others did so”. Shatter said he thinks it is “regrettable that Deputy Wallace forgot the incident” and welcomed his comments this morning about the incident. The Minister also commented about the “wild and wonderful suggestions that have been made, that I as Minster might be spying on my opponents”, and described this as “absolute arid nonsense”. He also said that that he has no time or interest in spying on anybody, and that it is important that people do their democratic duty in the Dáil. Shatter said that in no circumstances will he deliberately seek information from any member of the force to in anyway target any Dáil deputy. Shatter also rejected suggestions of a “sort of a conspiracy to spy on members of the opposition” as all “completely nonsense”. Shatter said he wanted to emphasise that Wallace “did nothing wrong”. If he is guilty of anything, it is hypocrisy but he is not guilty of anything else. According to Shatter, if Deputy Wallace makes a complaint about him with the Standards in Public Office Commission he “will happily respond to it”. He also said he will leave it for the general public to judge whether Deputy Wallace “standing on a soapbox and leading the charge to present himself as the champion of both ethics and standards has credibility”. The Minister said that under the duty that he was under to ensure maximum transparency in dealing with these issues, if he had not referred to that matter he could have been accused of covering up the fact that the discretion was exercised in favour of Deputy Wallace. 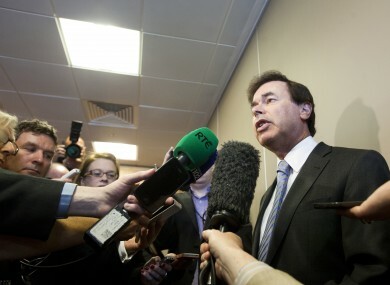 Shatter said he thinks it is important that the general public are in a position to judge the credibility of individuals. He said there is no question of him using private information, and that he was surprised the issue came up during the briefing. I was given the detail of how the discretion is applied and the different circumstances, and that particular matter came up purely as an incidental, and indeed I didn’t have too much regard for it because I took the view that he didn’t in any way behave unlawfully. The Minister wouldn’t be drawn on whether Garda Commissioner Martin Callinan was present at the garda briefing. Email “Shatter: 'If Wallace is guilty of anything, it's hypocrisy'”. Feedback on “Shatter: 'If Wallace is guilty of anything, it's hypocrisy'”.